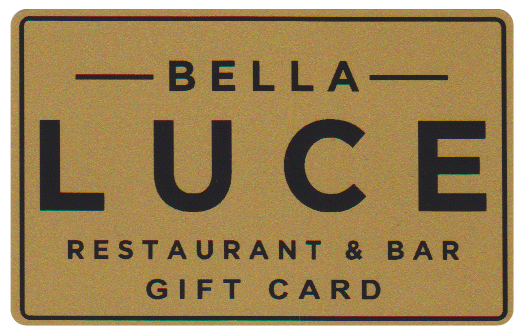 Bella Luce Restaurant and Bar Gift Cards make the perfect gift for that special someone including birthdays, holidays, thank you’s, or any special occasion. Standard shipping is always free and we offer an option for expedited delivery. You may also choose to order your Gift Card online and pick it up at the Restaurant free of charge. *Please note that Bella Luce Gift Cards may not be used for gratuity. Please order one Gift Card per transaction. $25 minimum denomination. We use the highest level of security to ensure your personal information is transmitted securely. Bella Luce Gift Cards are non-refundable and cannot be redeemed for cash. Bella Luce offers free USPS standard shipping for all Gift Cards purchased online. Gift Cards are normally shipped within 1 business day of receipt of order. Expedited, 1-day shipping, is available for an additional fee. Expedited shipping excludes Saturday delivery. Bella Luce is not responsible for Gift Cards that are lost or stolen. Bella Luce Gift Cards may not be used for tips or gratuity. Bella Luce Gift Cards expire 1 year after date of purchase.